The announcement for the September 12th Fire Engineering Blog talk radio, The P.J. Norwood Show has been released. I am doing something a little unique to get the message of the show out to you. Would you like to subscribe to this list? 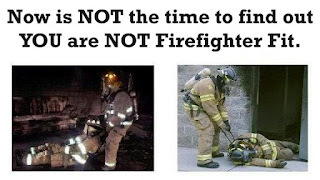 Every Fire Officer is an Instructor. Like it or not.. Believe it or not. Once a firefighter, always a firefighter - in this life and beyond! To Workout or Not, That is the Question? It is in great sadness that we as a Brotherhood post the 55th Line Of Duty Deaths in 2012 from the United States Fire Administration. Fellow Brother Firefighter & Asst. Chief Timothy Lamere has made the ultimate sacrifice in love for their fellow man. Our sincerest condolences go out to his family and members of the Constable Volunteer Firemen Inc. It is in great sadness that we as a Brotherhood post the 54th Line Of Duty Deaths in 2012 from the United States Fire Administration. Fellow Brother Wildland Inmate Firefighter Jimmy Randolph has made the ultimate sacrifice in love for their fellow man. Our sincerest condolences go out to his family and members of the California Department of Corrections. It is in great sadness that we as a Brotherhood post the 53rd Line Of Duty Deaths in 2012 from the United States Fire Administration. Fellow Brother Firefighter & Captain Roulos Davis has made the ultimate sacrifice in love for their fellow man. Our sincerest condolences go out to his family and members of the Chattanooga Fire Department. Why is a very profound word , esp. in our line of work. Today we are seeing this word being used quite a lot , not only by our younger Firefighters , but our older firefighters as well. years ago we did we didn't ask Why, we did as we were told , we did the job that was required by us, did we ask Why? , of course we did , but not out load , because we knew that an order was given and followed it . I stepped away from blogging back in April. The reason can be summed up in three words: my sister Dixie. It is in great sadness that we as a Brotherhood post the 51st Line Of Duty Deaths in 2012 from the United States Fire Administration. Fellow Brother Firefighter & Captain Mike Burgan has made the ultimate sacrifice in love for their fellow man. Our sincerest condolences go out to his family and members of the Sugarcreek Fire Department. It is in great sadness that we as a Brotherhood post the 52nd Line Of Duty Deaths in 2012 from the United States Fire Administration. Fellow Sister Wildland Firefighter Anne Veseth has made the ultimate sacrifice in love for their fellow man. Our sincerest condolences go out to her family and members of the Nez Perce-Clearwater National Forest. Here's my August Fire Engineering magazine editorial illustration. Yep, I'm sure many of you can relate!! It is in great sadness that we as a Brotherhood post the 50th Line Of Duty Deaths in 2012 from the United States Fire Administration. Fellow Brother Firefighter & Chief of Department Jon Tibbetts has made the ultimate sacrifice in love for their fellow man. Our sincerest condolences go out to his family and members of the Sandoval County Fire Department.